I’m pesto obsessed. I love pesto because anything can become pesto. I brought home these sweet pea tendrils from the farmers market the other day… I didn’t know quite what to do with them so I pesto-ed them. I usually reach for walnuts but I loved the spring color of the pistachios… plus, I just couldn’t resist the alliteration. Pea tendrils have a mild flavor that’s slightly sweet, which makes for nice mellow pesto. 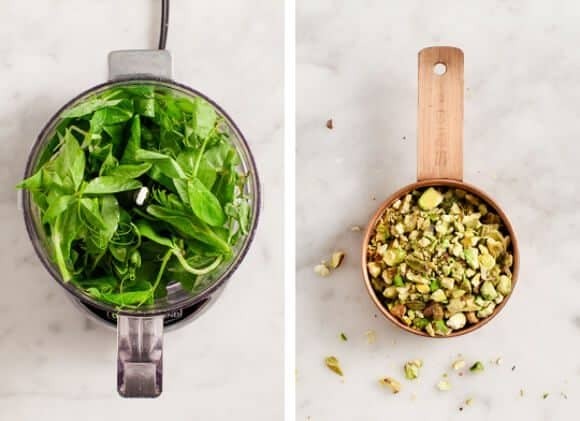 If you can’t find them, you can still make a nice pistachio pesto out of spinach, arugula, basil, or mint… whatever combination of soft greens and herbs you like. 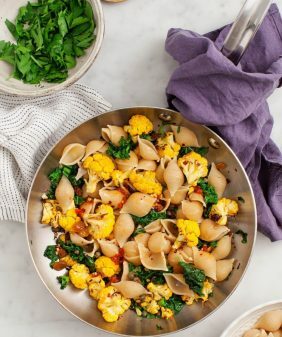 This lasts in the fridge for about 3 days – I put it on toast, mixed it into pasta, and added it to a few lunchtime kale salads. 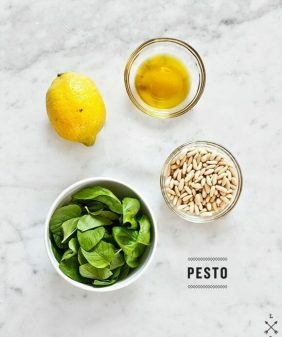 Pesto possibilities are endless! In a food processor, pulse together everything except for the olive oil. Drizzle the oil in slowly while the blade is running. Add as much or little olive oil as you want. Less oil will make a chunkier pesto, more olive oil will make it more smooth. to save time, look for raw shelled pistachios (in the bulk section of some stores). When our peas start coming up at the farm I am definitely making this. Sounds fantastic. So creative! Oh this looks tasty and easy to make. I am so excited! This is so beautiful! 🙂 And so great that nothing goes to waste, too! What a lovely spring-like pesto! 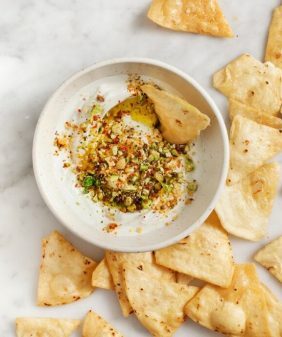 I am pesto obsessed too, though I’ve never used pistachios in a pesto of mine I definitely will try it out! …so ready for Spring and all things green. What lovely flavours – a gorgeous twist on a classic. what a sweet title for a sweet spring fresh recipe. I love pea shoots. So mild and almost sweet! I have made a pea and pistachio pesto before but I never knew the tendrils were edible too!!! I gotta get on this recipe! “I love pesto because anything can become pesto.” <— LOVING that. I've always felt the same way, but never totally realized it until I just read this. Pea shoots and pistachios! That sounds just about perfect right now. Love this! What a brilliant pesto idea. I can imagine how bright the flavor must be. Perfect for spring – which I am desperately awaiting! 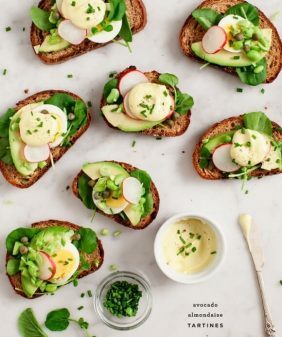 This looks like such a great spring time recipe! I’ve made pesto before with fresh peas – do the tendrils have a similar flavor? I’ve never tried them before, but they look great! And I’ve seen them at a local market, so I’ll have to pick some up! they don’t have as strong of a pea flavor – they’re pretty neutral greens, just slightly sweet. Pesto everything, I say! 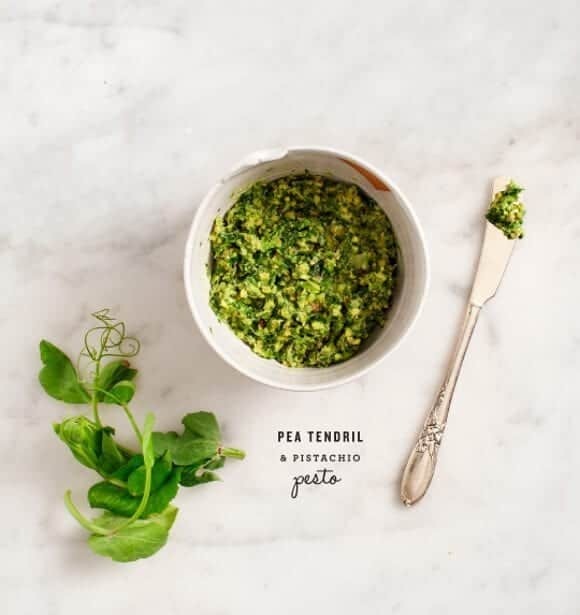 I’ve never tasted pea tendrils but this pesto sounds fantastic. Arugula pesto is one of my favorites and I have a bunch of kale destined to be pulverized for dinner soon. My kids are loving pea tendrils from our farmers market. 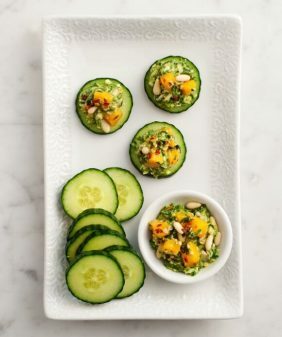 This pesto is such a great idea! Thank you for this gorgeous inspiration. Completely inspired me tonight while making another dish (Israeli couscous with asparagus and sugar snap peas recipe on epicurious). I had pea shoots and macadamia nuts so substituted those for the tendrils and pistachios. Delicious. We all finished our plates (even my toddlers), for once sad there are no leftovers. This recipe is definitely going into my go to file. What a great recipe, once again! 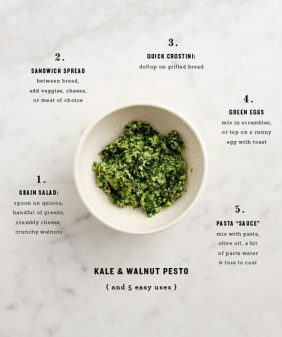 I still have some pea tendrils sitting in my fridge (I made a spring risotto with peas, asparagus, & pea tendrils yesterday) and this pesto would definitely be a great way to use them. Honestly, I’m so excited by this recipe! Can’t wait to try it. Thanks Sini! I did a pea tendril risotto also (with this batch) – so delicious! I am also pesto obsessed. Especially because anything can become dinner with pesto. Yet to try pistachio pesto, bet its good. Pasta would be nice, but I see this on some broiled or grilled fish. Bring on Spring! Yum!! i love new ideas for pesto. i just made my cilantro lime jalapeño pesto, so good! I was at the farmers market Saturday and came across a beautiful bundle of pea tendrils. I brought it home not knowing what I was going to do with them. I found this recipe and happened to have all the ingredients so I chose it. What a delightful pesto! I am going back next Saturday and will be very disappointed if they don’t have the tendrils again. I want to make a batch to freeze for winter bliss.